In a recent article, I reiterated the best legal advice you can ever get: shut up and always exercise your right to remain silent. As a Michigan criminal attorney, my office gets plenty of calls from people who have been contacted by the police (often a police detective) and who have been asked to answer some questions. While I hope this article will be of use to those who have not yet talked to the police about their “situation,” the reality is that many of those who read it will have already done so. Unfortunately, we are frequently called after the person has already spoken to the police and answered questions. Without fail, every single person who calls after speaking with the police says something like “I think I might have made things worse,” because they realize, although only after the fact, that they should have kept quiet. If you’re reading this after you’ve talked, don’t freak out. Most people do. Then my job becomes making the best of what we have to work with. The problem isn’t that people don’t know that about their right to remain silent, it’s that they don’t know how to exercise it and keep quiet when they’re being questioned by the police. Somewhat ironically, if a person feels uncomfortable refusing to speak to the police, it’s kind of a reflection of having been raised “right.” For example, I was taught to respect the police. It’s really easy for me to sit here and tell the reader to refuse to answer questions, but I know it would be a much different situation if I had law enforcement bearing down on me with pointed questions about some situation. I’d probably need someone to remind me to keep quiet. It goes without saying that we want the police to solve crimes. In that same way, we want everyone to pay his or her fair share of taxes so we can fund schools and keep up our roads and such, but each of us, understandably, wants to get out of paying as much as we can. We are, after all, a nation of laws and principles. The right against self-incrimination, has been part of our republic since colonial times. Since Miranda, it has manifested in the right to remain silent. As much as we have the right to not say anything, the police also have the right (and, I’d argue, a countervailing obligation) to ask questions and try and get people to talk. Although TV is not real life, a common technique in the British mysteries, which involve far less action and shooting, and focus more on mystery, plot and “detective work” is for the police to scramble to get the subject talking before his or her lawyer shows up, because it is essentially a given that every lawyer is going to shut down all questioning in every case. In other words, it is just assumed that no lawyer will ever want his or her client to be talking to the police. And that’s true, without exception, both on TV and in the real world. One key thing to bear in mind is that your Miranda rights apply only once you are deemed to be “in custody.” However, you have no obligation to talk the police beforehand, either. In other words, after identifying yourself, you don’t have to answer any questions. So how should the unprotected person handle things, when he or she is all alone, and the police come calling? Hire a lawyer. We’ll do it for you. This, of course, tends to play out a$$-backwards in real life. The way things usually get done here, in the American system, is that people tend to wind up speaking with a lawyer after they’ve spoken with the police. At that point, it’s kind of like buying a screen protector for one that’s already cracked. Imagine that police officer Paul has a brother, Bob, who lives in a distant state. Bob has a son, Tim (who is Paul’s nephew). One day, Bob calls Paul and explains that the local police have contacted him and said that they think Tim was involved in an accident and then left the scene. The police have tracked the car down to Bob’s address because Tim lives there and the car is registered there, as well. They tell Bob to have Tim call back as soon as he gets home. What do you think police officer Paul is going to tell his brother, Bob? Do you think he’s going to suggest that Tim call the police back right away and admit anything and everything he’s done? Paul is going to tell Bob to tell Tim to keep his mouth completely shut. He’ll probably advise getting a lawyer, but will certainly make sure that Tim never gets on the phone with the police, because he knows that the police are experts at getting people to talk. If Tim has anything worth saying, his lawyer can say it for him. This next part is important: if you start talking to the police at all, you’re pretty much done for. 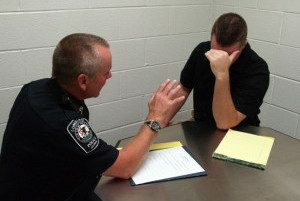 Police are trained and highly experienced in interrogation. For what it’s worth, the “average” police officer is probably an order of magnitude better than a “good” lawyer at this game. If the two squared off, I’d put my money on the police every time. Once you answer any question, they’re experts at getting you to answer more. What often happens is that a person may timidly say something like, “I don’t know if it’s a good idea that I say anything. Maybe I should have a lawyer…” They’ll usually do this because they don’t want to look completely uncooperative. Then, without fail, they start talking. The better thing is to close down any conversation, explain that you’ll call back, and hire a lawyer and let him or her contact the police for you. In my office, we’ll reach the detective or officer in charge and very politely and professionally explain that we’ve been retained, that our client won’t be speaking further, and that we stand ready to present the person at any time for booking, if necessary. The police understand the attorney’s position. They may not like it, but they’d wonder about the competence of any lawyer who did anything different, like offer to present his or her client for questioning. We make these calls all the time. Often enough, however, a client will contact my office after having spoken with the police. Never – not once – in the course of my career, has anyone said they thought they helped themselves by doing so. In fact, I can’t remember a time where someone didn’t express regret and say something like they don’t know how much worse they’ve made things. This is one of the few situations in life where there are no exceptions, and no “other side” to the story. You should always remain silent. If you haven’t already spoken with the police, let that sink in. And to the extent you read anything else, you’ll find that all lawyers unanimously agree on this point. Lawyers are essentially professional disagreers, so the fact that there is no disagreement on this point should tell you something. On my website’s homepage, the first thing I do is point out the differences between myself and other lawyers, but on this issue, we are all in agreement. Keep your mouth shut. If you have anything worth saying, your lawyer will do it for you. If you have spoken with the police, then the best comfort I can give is that, absent a violation of your Miranda rights, there is little to be done about that now. It is what it is, and whatever that may be, we can certainly make the best of it. Most people succumb to the pressure of being questioned and do wind up talking to the police. Remember, I said if it was police vs. lawyer, I put my money on the police every time. There’s nothing to be ashamed about in having talked, and all the regret in the world won’t help one bit, either. Since we can’t change the past, let’s focus on the future. If you are facing a criminal or DUI charge in the local, Metro-Detroit area (meaning anywhere in Oakland, Macomb or Wayne County) and are looking to hire a lawyer, be a good consumer, do your homework, and read around. Then call around. All of my consultation are confidential and done over the phone, right when you ring my office. We’re really friendly people who will be glad to assess your situation and answer your questions. You can reach us Monday through Friday, from 8:30 a.m. until 5:00 p.m., at 586-465-1980. We’re here to help.